options, thousands of premium lessons, student device collaboration, quad games, student assessments and on and offline options. 10 points writing & 20 points touch. Built in 2 x 12W speakers. LED life span 30 000 hours. Free bundled software licenses for Note 3, Connect & Capture included for Windows OS. (Optional extras - Built in PC Module i5/i7, wall mount and mobile stand options). 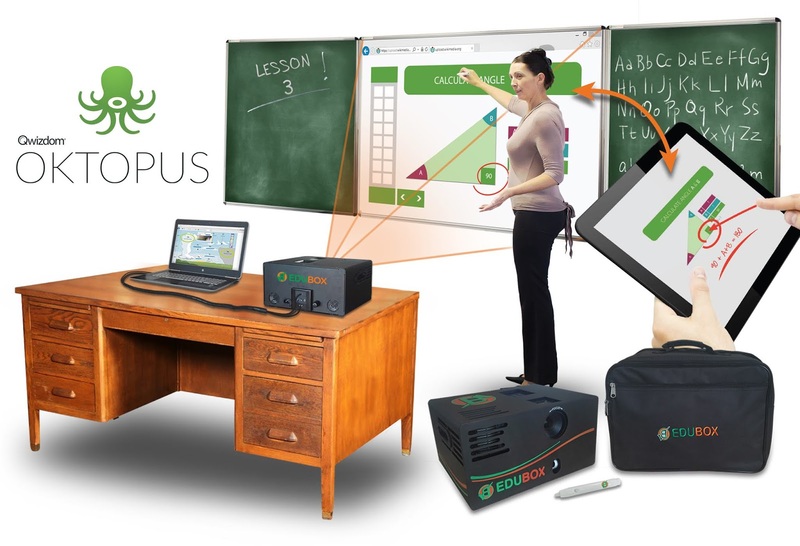 PLUS BONUS the Education EduTouch LED interactive smart Panel includes the all powerful Oktopus Blend for full device collaboration, quad games included + lesson conversion from other Educational Software packages. EduBoard offers full service and support from our friendly and experienced team. Full service includes equipment, installation, training, warranty support and maintenance. In addition all the non LED Panel interactive whiteboards dual purpose (matte white) and made in South Africa. They are available in various sizes up to 110” and offer a number of interactive hardware and software options. These boards are all dry marker friendly. Besides the all new EduTouch LED panel, EduBoard has three main types of interactive whiteboard hardware. The interactive whiteboard can be used with or without any of our professional teaching software's and with various different size whiteboards or types of data projectors. The choice is yours to create your ideal blended learning environment. Choose your size, hardware and software to fully integrate the students android or windows device with the teachers interactive whiteboard. 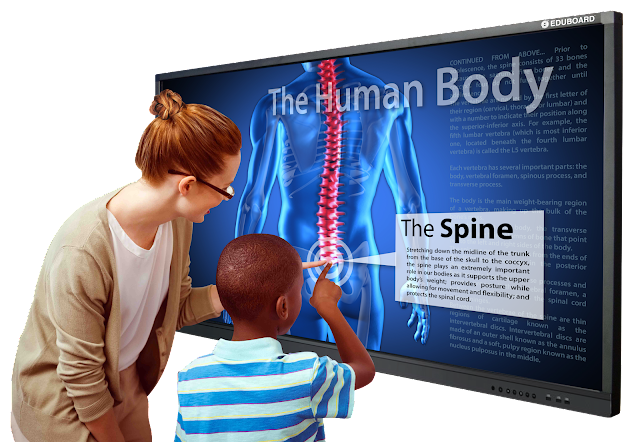 The EduMax system is our most popular interactive classroom solution. 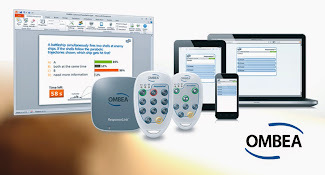 The system can easily convert existing data projectors and virtually any smooth, white surface or whiteboard into a fully interactive digital classroom. This allows the teacher full control of their computer and teaching software from the board, using the digital e-pen for navigating, writing and annotating. The EduMax is designed to work offline or online and with or without student devices. Teachers can engage, interact and annotate over any application or browser. Professional interactive teaching software allows teachers the opportunity to build their own media rich engaging lessons and/or download and utilise thousands of prebuild lessons using the E-Pen. A high quality speaker bar can also be installed for enhanced audio. This is the most versatile portable and practical interactive whiteboard in the World – we have never seen any portable solution quiet like this. 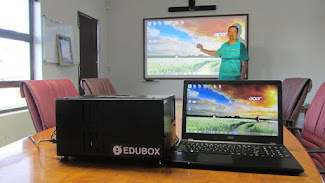 The EduBox has been designed, developed and manufactured in South Africa. Teachers who teach in different venues. Works on ANY normal whiteboard or write-on converted chalkboard . Includes a comfortable shoulder carry bag with laptop pouch. 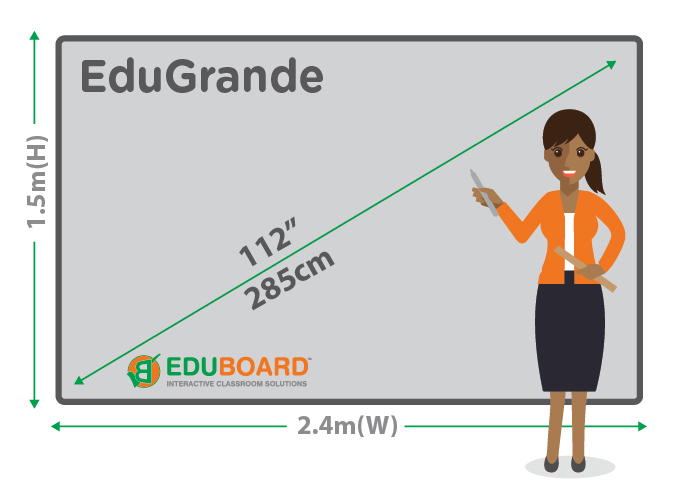 With a staggering active area of 110”, the EduGrande system’s whiteboard solution is the largest touch-enabled whiteboard in South Africa, and it complements the capabilities of the interactive data projector perfectly. The board is fitted with high quality matte material, making it ideal for dual-purpose use as a digital touch-enabled surface as well as for writing with dry markers. The board surface is extremely easy to clean and leaves no stains or ghosting. Additionally, the matte surface also helps prevent eye fatigue and bright spots which are often a problem associated with projecting onto shiny (gloss) whiteboard surfaces. Here is a quick YouTube video clip of the EduGrande touch interactive whiteboard. It is available from 91" up to an astounding 111" - making this the largest interactive whiteboard available in South Africa. The 111" board has a height of 150 cm and a length of 250 cm. We already have thousands of classrooms in South Africa using EduBoards. If your school is “thinking about” or “planning” to start using Interactive whiteboards or tablets we will certainly be able to offer you a solution designed to meet your needs. We have a great team of people ready to assist and support you, give us a call or drop us an email, we look forward to hearing from you. Do you have old chalkboards, need NEW whiteboards? Save 50% or more. Write-On board resurfacing material is a brilliant, high quality, cost effective and easy to install option. It is readily available in South Africa in gloss and matte white. The Matte whiteboard is suitable for data projectors and interactive whiteboards. It is really easy to apply and install. Have a look at the quick video below to see just how easy it really is. In many instances schools are saving much more than 50%. You can click here for more info and for school references. All Standard Board sizes, in both magnetic and non magnetic. Do you still have old chalkboards in your classroom? Resurface old chalkboards and turn them into new whiteboards. All in one fully portable plug and play Interactive whiteboard. It weighs 4,5kg and comes in a handy carry bag. EduBoard Interactive Whiteboards www.edu-board.co.za. Picture Window theme. Powered by Blogger.